September is my favorite month and this month I have many things to celebrate. In my last post I talked about how September 2nd marked my 1st Blogiversary for Mademoiselle Scientist. Next week I am starting a new series, Spotlight on Science. Since Irène Joliot-Curie and I share the same birthday (September 12) it makes sense to pick her as my Mademoiselle Scientist September Birthday Spotlight. If you want to check out my other Mademoiselle Scientist Spotlights check out my blog posts about: Dr. Françoise Barré-Sinoussi, Dr. Jewel Plummer Cobb and Dr. Mae Jemison. These are all amazing Mademoiselle Scientists. 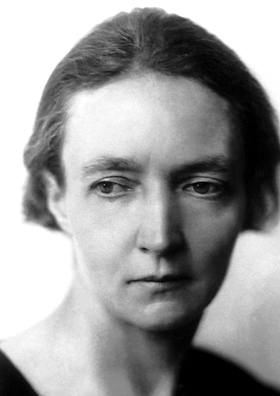 Irène Joliot-Curie was born on September 12, 1897 in Paris, France. She was the daughter of Marie and Pierre, two physicists that shared half of the Nobel Prize in Physics in 1903 with Antoine Henri Becquerel. Following her parents footsteps she also excelled at science and mathematics. She even worked with her mother, Marie Curie at the Radium Institute in Paris. Like her mother, she was committed to science, excellence, research, and discovery. Irène continued to excel and studied at the Radium Institute in Paris where her doctoral thesis focused on alpha rays of polonium. In 1925 after years of research she received her Doctorate of Science. While she was working at the Radium Institute she met a physicist named, Frédéric Joliot and a year later they were married. A few years later she was appointed as lecturer in 1932, and in 1935 their research paid off. They won the Nobel Prize in Chemistry for their recognition of their synthesis of new radioactive elements. After winning the Nobel Prize in 1937 Irène became a professor and later Director of the Radium Institute in 1946. To learn more about their Nobel Prize Award and others check out NobelPrize.org. Their discovery led to further studies and tools to help with cancer treatment. After many years working with very hazardous materials Irène was diagnosed with leukemia due to exposure of polonium. Later her health began to decline and she died on March 17, 1956 of leukemia at the age of 58 after a lifetime of exposure to radiation. Happy New Year!!! I’m excited! Are you excited? Last year was a year of extensive planning and one of the reasons I started Mademoiselle Scientist. Last year in this post I talked about planning for success and using the myIDP tool. This year my goal is to use that information to turn my plans into action. After the holidays are over you may find yourself back to your normal non-holiday season self and wonder, now what? There are many people around you talking about New Years Resolutions, Strategies for Success and Ways to Shed Holiday Pounds. After hearing people talk about this you may wonder how can this help me? Some of these resources are great, but overwhelming when you do not know where to start. Since the holidays are over and the weather has been below zero for the past few weeks I have been working on fine tuning my plans. The cold air was refreshing and motivated me to refresh myself. By the end of the post I hope that you feel refreshed and ready to turn your plans into action.